I've finally cleaned up the Python version of the avatar grabbing .bat file I released awhile ago. This version comes with a few other small Neopets Python scripts I've written, and it no longer opens a ton of tabs. 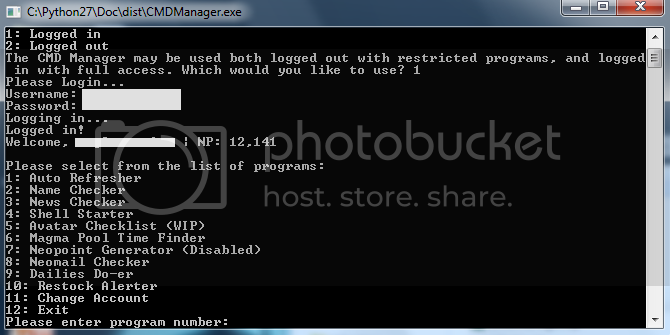 The program is called CMD manager because it doesn't have a GUI, so it has an interface similar to the .bat file. Navigation through the program is accomplished with entering numbers and strings. When it asks you for a file name to read/save to, a text file must be provided, any text file you want to use needs to be stored in the same folder as the .exe. It has no error handling, so if you mess something up, chances are it will just quit without saying anything. It will require a login, but if you'd like to make sure the functionality of the program is genuine, you can use a few of the programs without being logged in. I've also compiled the .py file into .exe for ease of use. (Thanks to py2exe) Lastly, I'd like to say that I hope any admins/mods are fine with me posting this here, I don't see why it wouldn't be, and that's why I'm posting without asking permission first. 1: Auto Refresher - Allows you to refresh on a specific page, or randomly visit pages. Reports when a random event occurs (although not what kind), includes editable refresh rate, amount of refreshes, and amount of REs that the program will allow before stopping. 3: News Checker (Untested) - Made to check the news. I've made some improvements and decided to enable it, although it is untested. Issues a beep and informs you when the news updates. 4: Shell Starter - Includes Clickable avatar grabber and BD challenger grabber. 5: Avatar Checklist (WIP) - Almost done, adds a few avatars to your output whether you have them or not. 6: Magma Pool Time Finder - Works as of version 1.1. Writes times that the guard was awake to text file so you know what hours have already been checked. Writes actual magma pool time to the text file, and issues a beep when it has found the time. 7: Neopoint Generator (Disabled) - The program will tell you that the neopoint generator is disabled, but you can still use it. It just won't make any Neopoints because the sponsor links are down. 8: Neomail Checker - A simple program that checks if you have any new neomails, alerts you if you do, and tells you who the neomail is from. A beep will play when a neomail is received. 9: Dailies Do-er - Does dailies. For most dailies you will receive a short message on what you got. 10: Restock Alerter - I made this mainly for myself, but decided to include it for anyone who likes the excitement of legit/semi-legit RSing more. Allows you to choose a shop ID to refresh at, and if you want "shop emptying statistics" (this is pretty much just a number that shows items leaving and entering the shop and gives you reassurance that it's still working on a slow restock day.) Also will beep when the shop restocks and will open a new tab in your default browser with the shop in it. Beeps twice and stops when RS banned. Default refresh rate is 6-8 seconds. Will make this configurable when I think of a smooth way to implement settings. 1.1 - Released Magma pool time finder, added beeps, and made the news checker available. Also added some error handling to increase stability. 1.2 - Added Restock Alerter and a bit more error handling. 1.2.1 - Added multiple login changes/fixes, and a few helpful additions. Thanks to Russ for suggestions! 1.3 - Added Discarded Plushie, Anchor Management, and Underwater Fishing dailies. Also cleaned up stuff. 1.3.1 - Added Symol Hole and forgotten Shore Dailies. 1.3.2 - Added proxy support, as per request. Enjoy, and please tell me if something is not working properly. Edited by Neoquest, 20 April 2012 - 10:15 PM. Thanks guys! Most of the planned features shouldn't take too long to add in, and the disabled programs are mostly disabled because I haven't gotten around to actually testing if they work. Screenshot fixed. if ya want a hand to test them out let me know mate. It's good, it's not that it's difficult or time consuming to test, I always just forget. Edited by Neoquest, 07 January 2012 - 06:33 PM. This is really cool!!! I'll be stalking this thread for updates Thanks! Edited by xangxang, 07 January 2012 - 08:43 PM. As soon as I get the computer fixed, I'm going to use this. Love you! Edited by Jaws, 08 January 2012 - 03:42 AM. I could release the just .py file, and it would work for Mac, but it would be a little more involved than just double clicking a .exe. I've tried it out (to do the dailies) and it works really well! I usually don't do dailies since they take me forever some how. >.> But this program helps a lot. Thanks! The dailies do-er includes apple bobbing, but not the discarded plushie. I'll see if I can add that one. The magma pool time finder is done, I just need to see if it works by running it for 24 hours. It shouldn't be too bad, I know Macs come with Python pre-installed, but I'm under the impression that the distributed versions are out of date. I'll PM you the .py and some instructions to see if you can get it working. Yeah I noticed apple bobbing today (whoops!) I can try out the magma finder for you if you'd like more data... is it just going to refresh every 5 mins until the guard is sleeping? A random range between 6 minutes and 7 minutes. I already know the Magma Pool time finder works, as I tested it myself, but thanks for offering. Okie dokie, I just turned it on, love the idea of the document, makes it much simpler than the GM script! ran your timer for about an hour and find the time for one of my accounts...I LOVE THIS PROGRAM! !